Periodontal disease is dangerous in that it is often painless and symptomless. Eighty percent of Americans will be afflicted with periodontal disease by age 45, and 4 out of 5 patients with the disease are unaware they have it. It is important to maintain proper home oral care and regular dentist visits to reduce the risk of obtaining this disease. 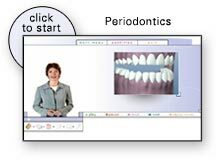 To provide you with a better understanding of periodontics, we have provided the following multimedia presentation. Many common questions pertaining to periodontics are discussed. The gum tissue can be very thick and large covering the tooth surface making the teeth look short. The initial stage of treatment for periodontal disease is usually a thorough cleaning that may include scaling or root planing. Several methods of anesthesia are available. Dr. Joshua W. Nehring graduated in 2011 from Dental School at the Virginia Commonwealth University, located in Richmond, Virginia. Dr. Mark A. Terry graduated from Dental School in 2010 from the UCLA School of Dentistry. Dr. Doerr is a 1980 graduate of Northwestern University Dental School, located in Chicago, IL.